The number one cause of injury-related death in the United States is drug overdose, killing an average of 44,000 people every year. According to Centers for Disease Control, 114 people die every single day because of drugs and 6,748 are sent to hospital emergency rooms for treatment. Substance Abuse and Mental Health Services Administration found that while addiction and substance abuse are undoubtedly major problems in the US, 90% of people who most need drug rehab do not receive it. The Substance Abuse Treatment market is expected to reach USD 4.68 billion by 2025, growing at a CAGR of 5.1% during the forecast period. The substance abuse treatment pipeline is led by cure for nicotine and alcohol addiction, with the 34 products in nicotine addiction bucket of treatment and 32 products for alcohol addiction under active development combining to produce over 50% of the total pipeline. Consolidation of smaller rehabilitation centers by the major rehab centers across the globe is gaining momentum to provide with the uniformity in treatment patterns, increasing capacity of major rehabilitation centers and expansion of rehabs across the region. However, incomplete health treatment program, extending period of clinical trials, incomplete understanding of the various aspects encompassing this global issue, inadequate services for treating substance abuse and high cost of treatment are expected to impact the target market negatively. On the account of, 242 companies marketing therapies for substance abuse, and more of these are involved in marketing treatments for alcohol addiction than any other kind; in addition, one in every 12 adults suffers from alcohol abuse or dependence in the US, which illustrates the level of demand for these therapies. Alcohol abuse treatment is the largest segment to contribute around 40% market share of overall substance abuse treatment market in 2017. On the back of emerging product segments include cocaine and opioid addictions, with 26 and 21 pipeline drugs, North America substance abuse treatment market is likely to grow at remarkable rate during the forecast period. Over 20 million Americans over the age of 12 have an addiction, 2.6 million people with addictions have a dependence on both alcohol and illicit drugs and 6.8 million people with an addiction have a mental illness is driving the US substance abuse treatment market. New Zealand, Iceland, Russia, Scotland, Brazil, Canada, Afghanistan, UK, Mexico, Australia, El Salvador, Iran, Netherlands, Slovakia and Spain are the opportunistic substance abuse treatment market owing to increasing drug addicted population and government initiatives to control substance abuse. The report covers the present ground scenario and the future growth prospects of the facility management market for 2017-2025 along with the market players’ analysis. We calculated the market size and revenue share on the basis of revenue generated from major players worldwide. Global Substance Abuse Treatment market is forecasted on the basis of revenue analysis, product benchmarking and strategic developments of key market players. Global Substance Abuse Treatment Market Outlook 2017-2025, has been prepared based on an in-depth market analysis from industry experts. The report covers the competitive landscape and current position of major players in the Substance Abuse Treatment market space. The report also includes porter’s five force model, SWOT analysis, company profiling, business strategies of market players and their business models. “Global Substance Abuse Treatment Market Report” also recognizes value chain analysis to understand the cost differentiation, pricing models to provide competitive advantage to the existing and new entry players. 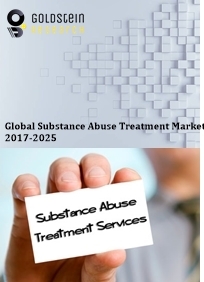 Our Global Substance Abuse Treatment Market Report comprises of the following companies as the key players: Accord Healthcare, Amphastar Pharmaceuticals, Apotex, BioCorRx, Cipla, Glenmark, INSYS Therapeutics, LFB Group, Lupin, Mylan Laboratories, Opiant Technologies, Sanofi Aventis, Sanquin, Sterinova, Sun Pharma, and Teva Pharmaceutical.